One of my responsibilities as Chair of the Materials Writers Interest Section, TESOL International is to organize panels for the annual convention. For the upcoming conference, MWIS has partnered with Career Path Professional Learning Network to put together a panel called Materials Writers Are Entrepreneurs. This panel has been designed to meet the needs of TESOL professionals at all stages of their career paths. Teachers, teacher trainers, materials writers, administrators and other educational experts have numerous skills that can be utilized in and outside of the classroom to assure career growth and satisfaction. Learn from a panel of successful TESOL materials writers as they discuss how to develop and use professional skills to maximize excellence in materials and diversify professional activities. Panelists will include Liz England, Principal, Liz England Associate; Walton Burns, Alphabet Publishing; Teresa X. Nguyen, ESL Garage and published author; Annie Marie Fowler, Speak Confident English; Jennifer Lebedev, Founder and Owner of English with Jennifer. Please let me know if you will be at the convention so we can meet in person! For some reason, I thought I didn't have very many "new" interviews but was surprised to see that I have five new interviews for this issue! Interesting in teaching online? Check out this website first! I'm always looking for teacherpreneurs to interview, so please get in touch! 7. Connect with me on social media. Teacherpreneurs must be on social media! P.S. 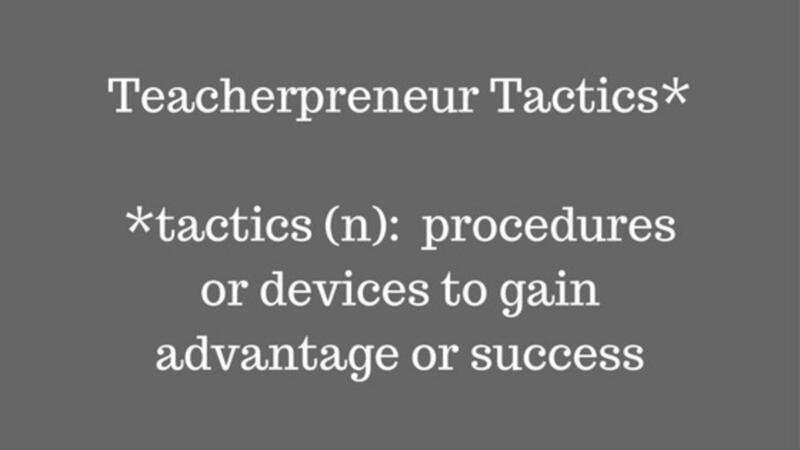 Please forward this email to other teachers with an interest in transitioning from teacher to teacherpreneur.